Here at Papillon Interiors we are very lucky to have such a great variety when it comes to styles and products, offering everything you could need for your home or work environment. Here are a few carefully selected examples of our wonderful storage range just a snippet to show some of the design versatility that we at Papillon Interiors have to offer. 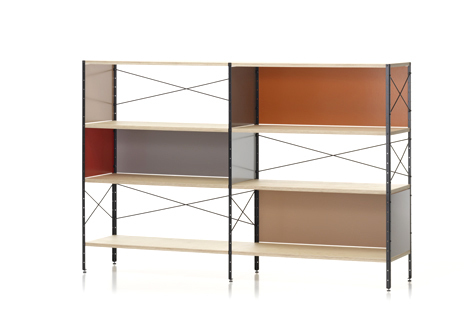 One example from Vitra is the Industrial sleek style of the Vitra Eames ESU Storage shelf and Bookcase. Ray & Charles Eames from 1949. The ESU Bookcase is constructed from metal powder coated shelves, with maple plywood shelves with a birchface veneer and clear lacquer. Screens are constructed from MDF with coloured lacquer. Feet can be levelled individually. The Industrial design really makes the ESU a fresh and contemporary feel with a colour scheme that resonates strongly with the 1940's and 50's giving it a versatile retro feel also. This next piece is an innovative modern Storage/workspace solution. 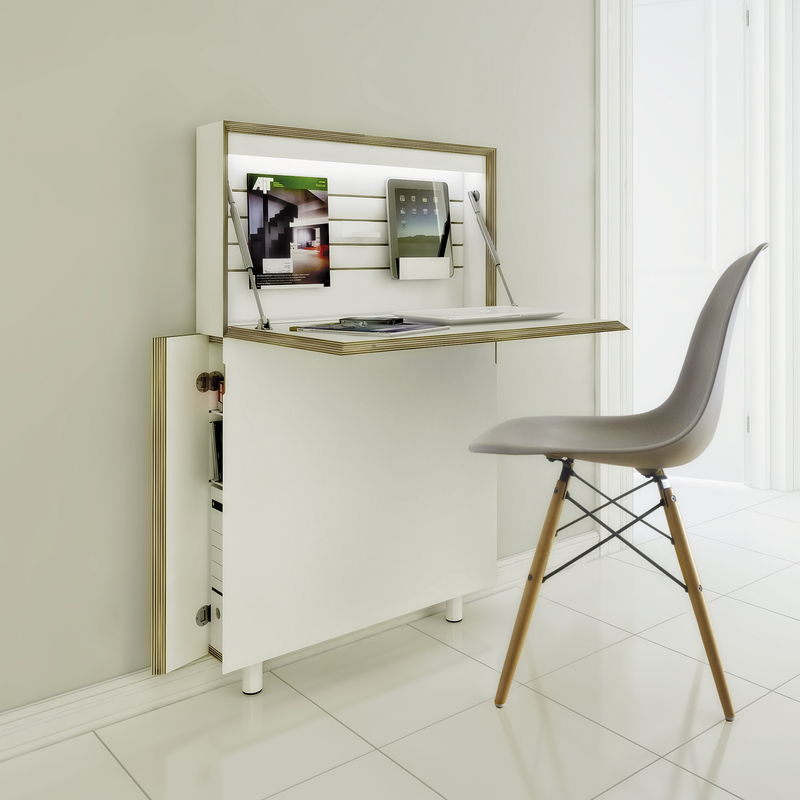 is a Winner of the Interior Innnovation award 2012 ,the Flatmate is the ideal modern work space solution for homes ,studies ,public areas and even bedrooms! The Ingenious Flatmate provides a full working desk platform as well as storage all with 0.09 M2 !! The space efficiency and sleek styling make the Flatmate a must have solution where workspace is tight or for multi tasking areas.The Flatmate's slim depth and low profile exterior allows you to utilize hallways, flats, bedrooms and other areas as additional workspace. Once opened it provides all the essentials for a small compact workspace, but once folded away it blends into the background, or alternatively make for a very stylish piece of furniture. 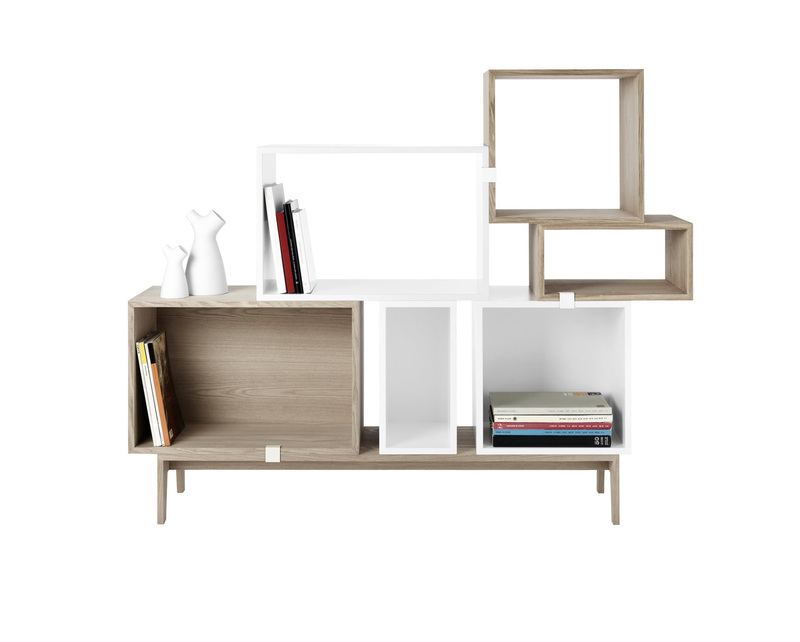 For an all together different type of storage option we also have the Muuto Stacked Shelving, a personal favourite of mine these are a quirky fun and really stylish storage option. By using the small clips, the Stacked Shelving System from Muuto can be arranged to quickly create beautiful shelf systems, room dividers, or even side tables. Making every Shelf unit unique to your home. with the variety of shapes and colours available you can really be quite the designer in your own right. They come in a MDF painted with either a white lacquer or ash veneer, The Medium sized units come with either yellow, grey or white backboards. Originally designed to be used in an industrial setting this ladder-inspired shelving system soon became a worthy home feature. With such a simple yet stylish industrial design Woody Low's beauty really shines through especially the subtle details in the construction parts and joints being exposed. Woody is available in several different sizes and can also be used as a free-standing shelving system, against a wall or even as a room divider. Our final piece is a really beautiful Sideboard that would be a lovely edition to any home is a piece by Normann Copenhagen. The Jalousi Sideboard inspired by a combination of 1950's furniture, conveyor belts and even watch straps this beautiful sideboard created by Simon Legald has a contemporary and classic feel. The Jalousi Sideboard features practical rolling shutters in inviting variety of shades, These coloured shutters form a real contrast to the cabinet body. The Body is an oak veneer with legs of solid oak. This great combination of materials and the stylised design of the shutter’s make the style young, retro and bold. The Jalousi Sideboard can be used in any space be that a dining area, living space or even a work area, a truly adaptable piece.